Skateboarding Game - The Answer is Never! Discussion in 'General Discussion' started by JamesArndt, Feb 13, 2017. Some other possibly important data: heavy female skater focus, heavy late 80's, early 90's aesthetic in color palettes. dogzerx2 and Ony like this. No - thats the suggestion for the name, not about the video. The board style/shape is inconsistent with the popular shape/style of that era. There were straight boards around, but they were not as numerous/common as the other shapes. This shape was a fad but lasted about 10 solid years. Are you planning for more board shapes/styles? Not_Sure, dogzerx2 and JamesArndt like this. Sk8 only with the 8 sideways like an infinity symbol. Yeah, I'm not going for that type of literal design. It's still modern clothing, modern boards, but I wanted to incorporate those color palettes and designs into the modern aspect. I am not against actually putting in some retro gear, retro boards and skaters. I actually skated during that time period, late 80's, early 90's so I know these types of boards and designs pretty well I had an old Powell Peralta deck very similar in shape to this one. Would have been about 12 or 13 yrs old then. Ony and theANMATOR2b like this. I would like that except it's just too close to the name "Skate" which is a really popular existing game series. Where do you get the licenses for using the artwork from those old retro boards? I'd imagine it's hard to track down the original artists. I wouldn't personally use any of the actual original artwork. Would end up creating vector designs in Illustrator based off of some of these palettes and geometric shapes. Forgot to mention disregard the hasty texture placeholder I slapped on the bottom of the skateboard in the video. That is a really cool existing design by or for Vision skateboards. Wouldn't ever see the light of day in a commercially shipped product though. Oddly enough another source of inspiration for illustrating designs of this period are the older Trapper Keeper folders for school. Not sure how many people here would remember those or know of them? Ony, theANMATOR2b and Martin_H like this. That's good to hear! I was concerned when I saw you edit out the text overlay from the source image. Yeah that was intentional too, to avoid extra discussions about using an existing commercial design when I am replacing it as placeholder once I start illustrating. Not a serious suggestion I guess. How inclusive/ exclusive do you want to be? chingwa, wccrawford, Ony and 1 other person like this. I have fond memories of that time period, as I also had a Powell Prealta board, the red one with the helmeted skull. (I think). My first was a hot pink Nash! OMG how loud those colors were back then! Depending upon the core theme - skate park - which weren't very common in those times, or pool skating, or street skating or ramp skating could lend to the name. Drop In - is catchy and instantly recognizable to the core community you will be targeting. Rombie, Ony, JamesArndt and 1 other person like this. wccrawford, carking1996, Ony and 2 others like this. Isn't the standard naming convention in skating games to name it after a famous skater? Is there someone you can track down who you can lisence from? Ryiah, Ony and JamesArndt like this. If you do this it has to be Christian Hosoi the only man to give Hawk a run for his money back then - and who could fly higher than any other person on a board. Hell yeah, definitely interested in a Unity skate game! Desktop or mobile? The skateboard looks cool so far in your video. As far as naming it after a skater, there are a bunch of super cool female skaters out there you could look into, depending on how serious the game idea is. Speaking of skating, I haven't been on a skateboard since like 1987 (hah!) 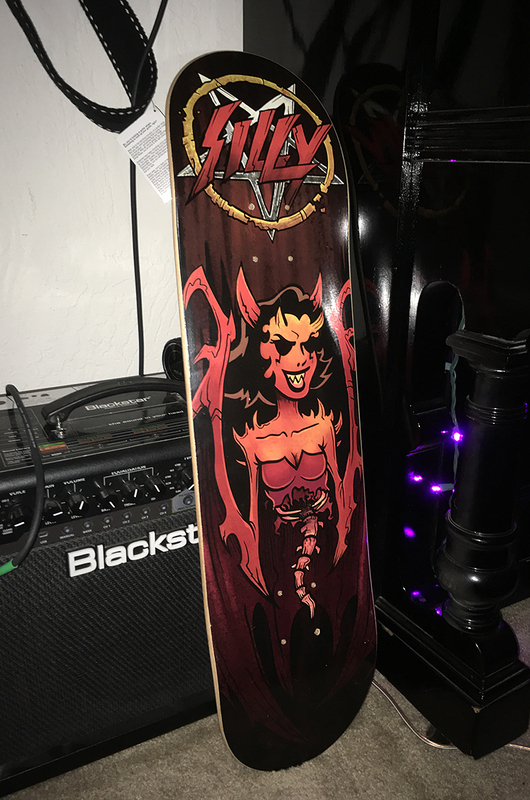 but I'm starting up again and just got my first new deck the other day. It's made by "Silly Girl Skateboards", a female-run deck company. Other good female-focused skate companies are Meow and Hoopla. theANMATOR2b, JamesArndt, Kiwasi and 2 others like this. I am working on a PC version right now, but I see no reason it couldn't be ported to mobile with a little UI and input adjustment. I don't know how successful I would be at getting a skater to lend their name to my project, but hey who knows. I am leaning towards a one word name, maybe a trick or something. I played some of the older games like Skate or Die or 720 and always thought they had really cool, simple names. I am using a lot of reference of Britney Conrad, Lizzy Armanto, and others. Watching a lot of their televised runs to get an idea of their different styles, both in skating and a more realistic idea of how these skaters dress. Googling "Skater girl" was the biggest mistake. The fashion industry has an entirely non-realistic idea of what the style is. I've found it's usually function and comfort over form for skaters who actually do this for a living. I did a little update today showing the modeling progress so far for the starting character. Rodolfo-Rubens, theANMATOR2b and Ony like this. Just call is it something rad man ... like Skate or die!!! GrinderGrrrlz Sk8 Party. It has a tough word..grinder..has girls growlz... grrrlz for further toughtalking, an alphanumeric pronunciation meme and a party. theANMATOR2b, Ony and JamesArndt like this. wccrawford and Ony like this. wccrawford and JamesArndt like this. Grind/er is a ubiquitous skateboard move involving sliding along an edge.http://www.skateboardhere.com/skateboard-grind-tricks.html. Ony and JamesArndt like this. Oh believe me I know what a grind is When I was 13 yrs old I was doing a grind across some coping on a quarter pipe ramp, fell out of it and braced my arm across the metal piping. My arm literally snapped in half, breaking both forearm bones straight through. I think grinding stuff is about as common as ollying over things too. theANMATOR2b and Ony like this. I just wrote a fully procedural hoverboard/skateboard/surfboard rider using only the Mecanim IK and a full body mask. Reacts to tilt, pitch and yaw, rising/falling, auto-pelvic centering and height based on foot stance length and width..accurate to the 100th of a meter parabolic jumping with speed based or designated height...local or world gravity..auto-lookAhead/lookAt/lookAround..all fully adjustable with sliders in the Inspector. JamesArndt and Ony like this. Hey I'm the first guy to do mobile builds first, but I got discouraged I think by all of the media talking about little guys getting pushed out of mobile app stores. Really I know it doesn't matter. If you make a quality project and people take to it you will have success with either platform. Bonus points if your game has "drop-in" multiplayer. carking1996, theANMATOR2b and JamesArndt like this. Ah look at me. I'm tired, what can I say. 3 am wake ups have apparently been hard on my brain. @landon91235 - Something to consider. Might have to be a unique implementation or idea for making that doable with an infinite runner style game. I'm sure it's been done out there to success. If i were making a skateboarding game I'd call it faceplant cause that what i did the most when i used to skate. I already used to play that skateboard game on mobile you released, was pretty good. You are far too kind to me. I put that game together in a week and a half. It was a test I gave myself to see if I could code a full game myself and ship it to the app store. I've come a long ways in C# and knowledge since then, so hopefully everything new is an improvement. One thing they have in common: You wouldn't really know if the game features guy or girl skaters...it's really agnostic of that. One word, easy to remember, seems unused, is associated with skating, and sounds close enough to "Trasher Magazine" to draw traffic but is different enough to not get a C&D. Damn, I'm good at coming up with names. wccrawford, theANMATOR2b and JamesArndt like this. You know ironically this exact name was going through my mind two days ago and I let it slip away. I think you've helped me find my name. "Thrash"
theANMATOR2b, landon912 and Not_Sure like this. Rodolfo-Rubens, Not_Sure and Ony like this. Would you mind showing me this, demoing it or something or perhaps even selling a bit of it? PM me with your email. In this video blog I discuss current development of the level manager and game manager. I also show some of the progress on character art. I think I'm going to start a thread in the WIP forum and move my updates over to there. elmar1028, dogzerx2, jake3560 and 2 others like this. Super cool. Looks good so far, James. Or with a "y" at the end. I admit its a bit complicated. Not saying these are a problem: searched on "thrash games"
I also show some of the progress on character art. Curious to see the character in - less than - traditional skater clothes. Even back then skater attire was more baggy and loose, with bandanas tied and hung in certain areas. Really like the info about how your considering setting up the scenes though, and hope the half pipe is included. frosted and JamesArndt like this. How about: Skateboarding Simulator Pro? Gnarly Girl Sk8er Chicks™ - the Game. Skate or Die... holy crap, I remember that game. (I'm so old). I vote for baggier clothing. Go for the 90s man, way cooler. PS.. I was already gonna call my game Thrashed... or Streets... but I have yet to decide the name... But you should know, Thrasher has a right and incentive to protect their trademark, in which they will have to sue. So be careful. The forum has private messaging; this would've been a better avenue.